We are headed to Minorca in September! Spanair filed a fare for Calgary to Mahon that was missing a digit. SK's YYC-MAH fare EKWCA was C$55, plus taxes and surcharges. The fare has since been refiled as C$855. The only routing available was the straightforward YYC-AC-YYZ-AC-MAD-SK-MAH and return. Fortunately, there are Spanair codeshares of Air Canada flights Calgary to Toronto and Toronto to Madrid. This means no AC fuel surcharges, and a modest total cost of US$96. I expect 10,050 UA elite qualifying miles from this. 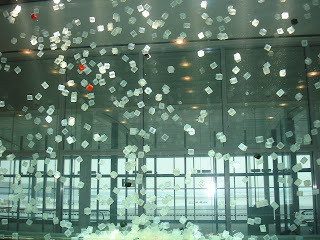 I look forward to seeing the public art in YYZ's T1 again!